Orcadians can be subtle—but usually not when referring to people from ‘Scotland’ (as they call the land to their south; they have a Mainland of their own). The title of this blog came verbatim from farmer from Orphir debarking from the M.V. Hamnavoe to be met by his wife at Stromness pier in reply to her query how busy the voyage was. Scots can also be a bit like that when it comes to Sassanachs. But, thankfully, we have realised it’s a half millennium since Flodden and tourism offers major opportunities in the 21st century. 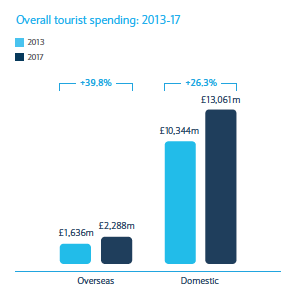 This summer, Barclays bank published a rather upbeat analysis of tourism potential in Scotland, done for them by retail research agency Conlumino. 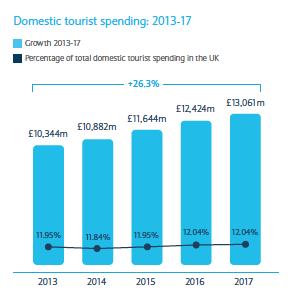 Increase in UK domestic tourism of 27% was expected to be surpassed by foreign tourism increasing by 33% to give a total market of over £135 billion by 2017. The general upward trend of tourism in the UK was even better in certain parts, especially London and Scotland. The top four countries supplying the UK with international tourists—USA (10.8%), France (6.6%), Germany (6.2%) and Australia (5.0%) will be joined by China (3.9%) within four years; no other country will have a share greater than 3%. The proportion of retail spend by international visitors is expected to remain steady at twice that of domestic tourists. But their actual spend on accommodation, dining and leisure are each expected to increase by around 33%. 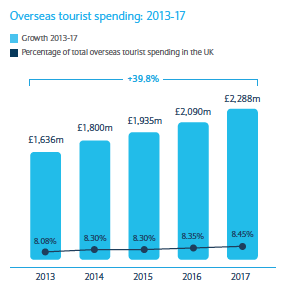 Those international visitors are expected to increase the proportion of their spend in London from 62.9% to 64.0% by 2017, a stunning £15.1bn total. The only other UK ‘region’ to increase its share of the cake is Scotland—from £1.6bn to £2.4bn and taking 8.5% to be bigger than any other English region, N. Ireland or Wales. Total tourist spend in Scotland is expected to top £15bn by 2017. Opportunities, indeed. All three charts contain good news for tourism-related businesses—and even simple infrastructure staples like ScotRail benefit. North Berwick station now sees over 500,000 passengers each year. Ten years ago, the figure was 360,000. Over one half of the growth came in leisure travel and a higher proportion (perhaps one in four) were overseas tourists who arrive by air and don’t trust themselves on our narrow roads in a right-hand-drive car. That means not just more ScotRail income but a filling of empty trains heading out of Edinburgh in the morning and returning in the evening—a contraflow to commuters. Overseas spending on fashion retail is expected to rise by 42%. This means the Jenners-style outlets should do well, providing a wide range of Scottish-sourced goods in an historic ambiance. Although larger, domestic retail is only expected to rise by 30%. But, since many of those are English, the same advantage accrues to distinctly Scottish outlets. Locals in Kirkwall tend to sniff at the Orkney Soap, Jane Glue and Jolly’s outlets in the main street but these places do a booming trade with cruise liners that call regularly. Overseas tourist spend on accommodation and eating out is set for a 40% growth, so hotels who understand their market will profit hugely. A good example is the seriously off-the-beaten-track Moor of Rannoch Hotel that recently won the Cesar Newcomer of the Year award, thanks to its blissfully isolated location with board games and books replacing radio, TV and wi-fi. Those satisfied employing untrained teenage serving staff who snottily tell guests that the kitchen is now closed for lunch at 2:04pm are likely to get short shrift. But the biggest growth expected in all sectors are leisure attractions, projected to grow by over 46%. Given that top places like Edinburgh Castle are already overcrowded in the height of the season, this implies that creative new activities like the Foxlake wakeboard park or Glenkinchie distillery in East Lothian ought to benefit by overspill that is the zoo of Edinburgh in the summer. But even in far Orkney, the Orkney Brewery and Highland Park distillery already attract record numbers by having friendly sales areas and restaurants as well as tours and tastings. Having recorded a bumper summer on the back of the 2014 Commonwealth Games, Glasgow is finally elbowing its way into a position to capitalise on these opportunities. Long famous for being dressier and more fashionable than their Edinburgh counterparts its Style Mile is drawing in tourists as well as locals. Added to the Kelvingrove and the Science Centre (as well as the SECC) and a pivotal jumping-off point for Scotland’s magnificent West Coast, there are now as many overseas visitors each year as there are population (600,000). The £300m refurb of the Buchanan Galleries and the £390m redevelopment around George Square ought to set the city on track to meet the 2017 opportunities. Barclays paper provides a case study of the Corinthia Hotel in London. The 5-star 300-room hotel has carved itself a niche in a very crowded Central London market. It owes its success to a deep understanding of needs of its customer base and how to capitalise on the hotel’s surroundings to fulfill them. It concludes with a series of a half-dozen considerations with associated bullet points how tourism businesses can pro-actively grow their market share.